Binance Review – Aiming Straight for the Top? We may be compensated when you sign up with Binance via our referral link. Most people know Binance (binance.com) as one of the top cryptocurrency exchanges, one that offers the best trading conditions, and that may indeed soon become the top exchange by every conceivable metric – including 24h trading volume. Binance is a lot more than that though. The most accurate way to depict it, would be to call it a sort of “crypto ecosystem,” which features several platforms and services to fulfill cyrptocurrency needs ranging from media and information output, to trading currency and to investing into fresh ICOs. Binance have also launched their own ERC20 crypto token a while ago, one that has since seen impressive adoption and one that – unlike most of its ICO-birthed peers – has actual utility. Let us take it one step at a time though, and examine the various components of this ecosystem, one-by-one. The info/media side of the business is not particularly significant from an operational perspective and it is not linked from the official homepage either. Obviously, the exchange is the centerpiece, around which everything was built up. It comes in two web-based versions, which can be accessed directly from the homepage of the operation: a Basic and an Advanced version. Both versions offer intricate charting tools and access to a staggeringly massive array of cryptocurrency pairs, which are neatly broken up into 4 categories/markets, making it easy for traders to locate the pair of their preference. The four markets are Bitcoin, Ethereum, BNB and USDT – for that vital link to the “real” world of fiat currencies. You can also buy and sell Litecoin, Dash, IOTA, Monero, Ripple. BitConnectCoin and more than 90 other altcoins. The main trading platform is web-based, but there are different versions of it available for users of Android- and iOS-based mobile device users. In case you were wondering, BNB is indeed the token issued by Binance, which can be used in several ways by clients of the exchange. Its most basic function is to pay for exchange fees. Those who use BNB to this end, are offered a 50% discount automatically. The trading fees are set to 0.10%, so they are rather generous to begin with. The way BNB is set up, some 200 million units of it will ever see the light of day, of which the exchange plans to buy back some 100,000 million, effectively halving the circulating supply, while making sure that the value of the token keeps rising in USD terms. The path set forth in the whitepaper of the exchange seems to be working too: while upon its launch, one BNB was worth $0.50, these days it’s trading for $8-9 and it has achieved a very impressive market cap, which at one point had it ranked the 20th biggest cryptocurrency. The user feedback regarding Binance is outstanding. People are excited about BNB and about the services offered by the exchange. 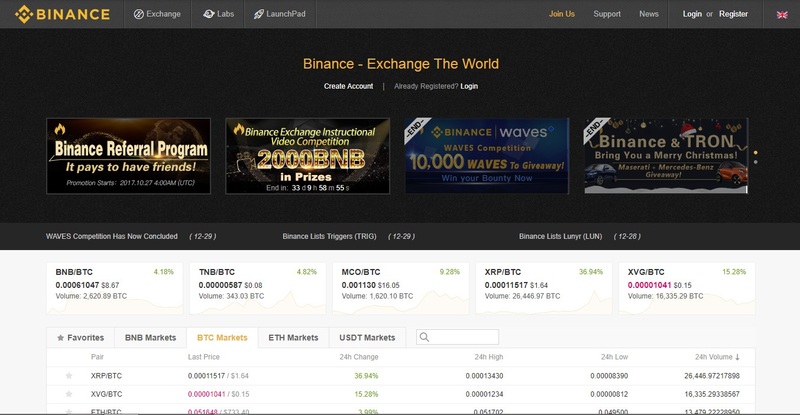 According to the promotional video posted at the Binance website, the exchange can execute some 1.4 million trades within a second and it can handle some 20 million users logged onto it simultaneously. Withdrawals and deposits are fast too, and the exchange does not feature complex and intrusive ID-verification (for now, at least). What’s more, Binance add new coins all the time and they give their users a useful early peek into ICO’s they deem interesting and potentially profitable further down the line. Binance Labs is a very interesting platform aimed at helping other blockchain startups get off the ground. To this end, Binance offer funding, advice, ideas, resources, and Launchpad listing. This is the company’s own way to expose such new projects to the general public. The flipside of Binance Labs is Binance Launchpad, which lists next generation blockchain initiatives, letting the public decide whether it makes sense to invest in these projects. What’s truly amazing about the Binance experience is though that all the above was accomplished in a remarkably short time. The operation was only launched in August 2017, and it is already challenging industry heavyweights like Bittrex for the top spot, with many users clearly favoring Binance over the former. Among the advantages offered by Binance, high liquidity, high performance, multi-language support and a truly global reach are also mentioned. While clearly Asia-focused, the operation maintains offices throughout the world, serving all comers, from wherever they may be. The About Us page of the operation does not offer a clear insight into who the people running Binance are. We are told though that people with experience at Bloomberg, Blockchain.info, Morgan Stanley and Nomura Securities are in the fold. Chanpeng Zhao is the leader of the Binance pack. As far as contact information is concerned, all we are given is a handful of Telegram addresses (for various languages) and a QQ group. According to user feedback, the Binance support seems to work well. People have expressed hope that this department of the operation would not head down the trail blazed by the likes of Bittrex. With all the above in mind, the answer to that is obviously yes. While there have been sporadic complaints about the services offered by the brokerage, everything seems to have been addressed by the Binance Angels, Binance’s special community of support-providers. There are no question marks and red flags concerning Binance for the time being, although it wouldn’t hurt to get to know more about the corporate entities and people behind it all. Interestingly, a simple search will reveal a rather large number of complaints from Binance users. Digging deeper into these complaints is definitely warranted though, since most of them turn out to be people screaming ‘wolf’ way too early. Binance support already has most of these problems sorted out. Delays regarding withdrawals seem to be the top complaint triggers, though – as said above – the threads that have developed in the wake of these complaints have laid these issues to rest, almost without exception. Binance seems to be a serious, solid and extremely popular cryptocurrency exchange, with a global reach. Though its background is somewhat murky, the quality of the services it offers (quick execution, fast withdrawals, reliable support and outstanding trading fees) make it the top choice for many crypto community members out there. Adding to that the fact that the operation is actively involved with the startup/ICO scene, it does indeed make perfect sense to assume that at one point, Binance may indeed become the top dog of the crypto exchange world. Interested in learning how to day trade cryptocurrency? Start right now with Lesson 1: Opening an Executing a Trade Using Binance. BTC, ETH, BCC, BNB, LTC, NEO, CND, XLM, IOTA, ICX, XRP, ADA, TRX, XLM, POE, XVG, EOS, MCO, VEN, LEND, TNB, REQ, BRD, ELF, QSP, BTS, QTUM, SNT, AION, FUN, STORJ, MOD, DASH, OMG, SALT, MANA, GTO, HSR, KMD, SUB, RDN, XMR, ETC, OST, FUEL, ADX, CTR, LRC, ENJ, ZRX, POWR, TNT, LINK, AST, LSK, ENG, KNC, TRIG, CDT, CMT, WABI, WTC, MDA, SNM, MTH, RCN, GXS, STRAT, ARK, BAT, ZEC, WAVES, ICN, AMB, WINGS, MTL, OAX, NULS, BNT, VIB, PPT, BCPT, DNT, SNGLS, NAV, BCD, BQX, EVX, YOYO, XZC, ARN, BTG, EDO, GVT, NEBL, LUN, DLT, DGD, ZEC, GAS. What’s your take on Binance? Share with us by commenting below! Read more Bitcoin and Cryptocurrency Exchange Reviews. anyone tell me if binance can transfer money in their system to my bank account as im her in Dubai ? SCAM and fraud, the Internet is full of reports about them NEVER responding to support tickets. Many people tried for THREE MONTHS to regain access to their account and they basically don’t even read support tickets ever, just automated response again and again [tried 20 times over 1 month]. I give it a 9/10 due to the high minimums for trades, sells, withdraws and buys. It makes it difficult for a hobby trader to just have a little fun and make a few pennies here and there. The bnb coin that you can get, although annoyed at first by being “stuck” with this coin due to the aforementioned high mins, has actually been a pleasure to have because it A.) Saves me half on fees and B.) [Most importantly] has actually made me the most money by simply just owning it because it grows faster and more stably than any other I trade. There is also the verification issue whereas it tells me I need to be logged in on a pc to finish verification. Seeing as how I dont own one its a fairly large downside. Everything else from speed of tx to service and platform stability are awesome though. I’m going to stick with it because all the minor issues I talked about will be fixed soon I’m sure. It’s still in its teething stages. I agree with your review completely. Binance has set the bar higher. Out of 5 stars I give it 6. I have Binance. Excellent exchange. Smooth trading with them. I just wish they would offer trading access to more coins.